Roadkill Revenge is an action physics based point and click game from kizigames. 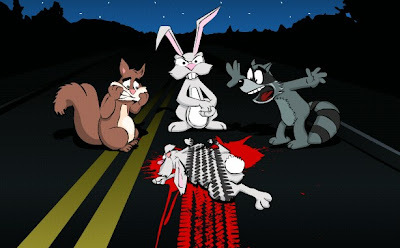 The roadkill prone animals have had enough of us reckless driving humans and they're out to take vengeance. Did I mention that this game showcases an awful lot of explosion? Blow up cars, missile trucks, oil trucks, train and even F16 fighter planes. Each levels is a big chaos waiting to happen. RR is very entertaining and has a lot of challenging levels to beat. Also, you can ulock 5 bonus levels if you can complete all challenges in every levels. Here is Roadkill Revenge walkthrough we found so far.